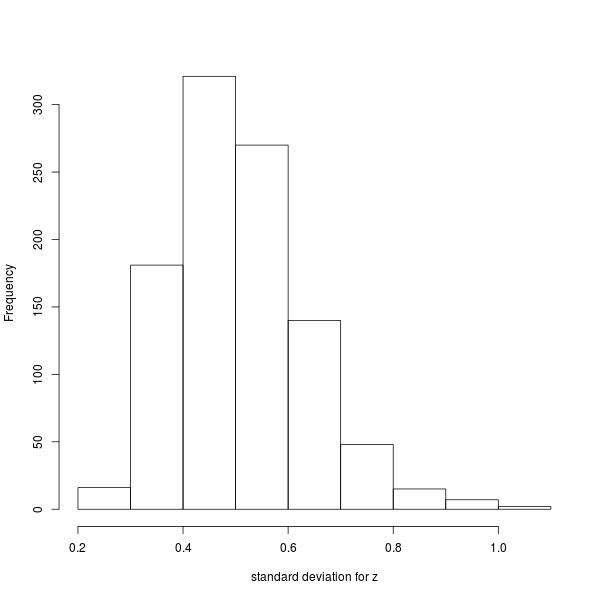 This will add the new function inla.contrib.sd which can be used to express the uncertainty in the structured ("random") effects of your INLA model in terms of the standard deviation, instead of the precision (which INLA gives by default). 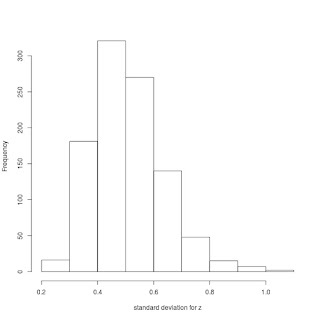 "inla(formula = formula, family = \"binomial\", data = data, Ntrials = Ntrials)"
Now, while the summary of the posterior distribution for the precision of the structured effect $z$ is of course just as informative, it is in general (more) difficult to interpret, because it is on the scale of 1/standard deviation. On the other hand, you can't just take take the reciprocal of the (square-rooted) summaries to obtain info about the posterior distribution of the standard deviation, because the transformation is not linear and thus it does not directly apply to the moments and quantiles. [You need to specify the INLA model, m in this case, and you can also input the number of draws you require from the posteriors $-$ the default is nsamples=1000]. which in this case produces the following graph.